As most of you know from other pages on Emily's site, it was a year later when Jane Doe was finally identified as Emily. The police said that when they found Emily's body that they had sent out information and photos and fingerprints over the teletype to every police agency around. If this was true, then why didn't they know who she was in the very next county??? Good question, huh?? We've been trying to get the answer to that for over 19 years now. 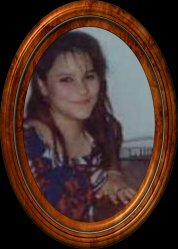 So Emily remained a Jane Doe in Comal County and was buried in a potters grave "Without Her Son". One of the reasons that we don't understand why San Antonio didn't recognize her and didn't match her prints right away was because Emily had a juvenile record and her own dad(Roy Garcia) had called the police 4 times and had them pick Emily up for running away. This may shock you all, but no matter what the situation may be, a parent "Can Not" get their child's juvenile record, even after they are dead. Only the juvenile themselves can get the records, so I guess that was the excuse they made for not identifying her. Det. David G. Ott and Mark Reynolds of the Comal County Sheriff's office. We talked with the young man from Zoeller's Funeral Home that had been chosen to transport Jane Doe to Austin. He was only a teenager at the time and that was his first time transporting or even seeing a dead body. He did say that when he got to the dump site, that he took a sheet and put over her, because they just had her laying there naked with all these people standing around looking at her. We were very happy to hear that from him. At least he respected her enough to do this. He said the trip to Austin made him sick because he couldn't get the sight of Emily's abused and naked body out of his head. He said that he quit working for Zoeller's Funeral Home after that, so Emily was his one and only case. God bless him!! And we thank him so much for talking to us and finding out that he had covered her naked body and let her have some dignity and respect. On the next few pages, you will read more on Emily's case and also her autopsy. We hope you will take your time and read it all. Maybe there is someone out there that can answer some of our questions. God bless you all. Please light a candle in Memory Of Our Angels Emily & Emilio Garcia.